This connotes being an amateur. In describing yourself as a "freelancer", you're suggesting that you don't do this full time and although you may have the skills to do the job, your business practices are inexperienced. Instead, use "professional". BAD: "I'm a freelance landscaper." GOOD: "I'm a landscaping professional." Even if someone knows they have to spend money (ie. groceries), many can feel icky when thinking about just the numbers. If you're selling your services and quote them your "pricing", they will miss the entire point and ignore the value of what you offer. Instead, pitch it as an "investment". BAD: "Here are my prices." GOOD: "Your investment begins at $____." Speaking of money, hooking people in with "free" offerings can be a blessing or a curse. This one depends on your industry and the cost of your services. If you're trying to sell a premium product, don't wave the word "free" around and then expect potential clients to jump on board with the full priced shebang! Somewhere in there, the use of the word "honestly" suggests that you weren't necessarily being honest up until this point. Even if you're just being super casual as a part of your brand, try to avoid this word altogether! Another money language no-no! The second you "discount" your services, you immediately decrease their suggested value. BAD: "Receive a 10% discount on your package..."
GOOD: "Limited time offer for packages booked." or use the word "bonus"
It's quite tricky to avoid this one in business, especially if you're being hired to solve a client's problems. However, any word that has a negative connotation might subconsciously plant a seed of doubt in your potential clients mind. BAD: "The problem with that is..."
GOOD: "This challenge would be resolved by..."
Don't assume anything is obvious in the booking process. Saying "obviously" could come off super condescending! BAD: "Obviously this would mean that..."
GOOD: "This would mean that..."
Stop turning away potential clients and start refining your brand language! Yass! Check your email to confirm your free download. What WORDS + PHRASES do you avoid in your website copy or emails? Post your answer in the comments below! Thanks for dropping by! 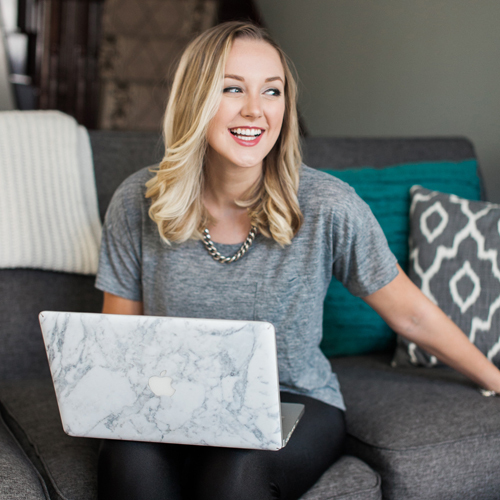 I'm Caileigh and I create killer brand identities and offer coaching for creative entrepreneurs with gumption. When I'm not helping people build profitable businesses, I document love stories as a fine art film photographer. Connect with me on Facebook, Instagram, Twitter, & Pinterest.